We arrived in Nouakchott shortly after noon today. All we really need to do here is buy some groceries and get our visas for Mali, but it’s Friday and the embassy won’t be open until the next working day on Sunday. We spent the afternoon uploading web updates at the internet café (hooray for fast internet connections and qwerty keyboards!!). The campground is nice and shady, but they play rap music on the boom box all day, which gets a bit tiresome. We had a good dinner at a local restaurant and were happy to get to bed early. We decided this morning to stay at a nice hotel today, so after breakfast we drove around town checking out the fancy top end hotels. Mauritania doesn’t have any ATM machines, so we have to conserve our supply of cash. Therefore the hotel had to accept Visa. We found one with a nice pool and decent rooms. It used to be a Novotel, but they have just built a new Novotel in town, and this one got redesignated “Monotel.” You could tell it was old, but it was well maintained and the pool was great. It cost about 20,000 Ouguiya per night, or about $70. Witt and Jen spent some time relaxing in the pool while Connie and Graham enjoyed a nice air-conditioned nap. After some laundry in the bathtub, we went to Pizza Lina for dinner (we had had lunch there as well). Graham and Witt had their first taste of beer since Marrakech and it went down very nicely with the pizza. It was almost worth the 1000 Ouguiya it cost! We awoke this morning after a very restful night’s sleep in the comfort of air-con. We filled our water jugs and went to check out of the hotel. Some French aid workers staying at the hotel warned us that the proprietor was charging their credit cards in Euros, and was using 250 Ouguiya to the euro as the exchange rate. The official rate is 350 and we’ve been getting 370 changing on the street. So now our $70 hotel is costing us 84 euros after the tourist tax. Seemed more like a tourist screw job to us. We did have the option of changing cash to Ouguiya on the street and paying in cash, but the whole point was to avoid depleting our supply of hard currency. So we accepted our medicine and went on. Next we headed to the Mali embassy to get our visas. We dropped off our passports, filled out the paperwork, and paid the 2000 Ouguiya per visa and left with instructions to come back at noon to pick up our passports. We did some grocery shopping and then went to the internet café. At noon we returned and picked up our visas on schedule. We talked about a third and final pizza before we left, but we were eager to leave Nouakchott and started out of town. Today was the first working day since we’ve been here and the increase in traffic is noticeable. Driving here is absolute lunacy. Cars in roundabouts are expected to yield to traffic flying through from entering roads. Traffic lights where they exist are mere decoration, and stopping at a red one invites angry honking from behind. A common practice for drivers merging onto a road is to reach out the window and make a “slow down” motion with the arm, indicating that you are to let them in. Many intersections are uncontrolled, and traffic there is left to figure itself out. This amounts essentially to playing “chicken” with oncoming traffic. Things flow along relatively smoothly as long as there isn’t too much traffic. We experienced one intersection in particular that demonstrated the inefficiency of this method. Cars were backed up in all four directions, and there were cars pointed in every direction in the intersection itself. Whenever someone would move, everyone behind would jockey for position to take up the empty space and inch forward. Cars were going around the intersection on the outside (plenty of room for this on the dirt verges), only to encounter the traffic trying to enter the intersection on the other road. Our size and the fact that our vehicles are completely enclosed in steel make us particularly well suited to this game. Witt was leading and moved forward to edge out a van vying for the empty space ahead. At the same time a Mercedes taxi (all the taxis are old, beat up Mercedes 240Ds) decided that reversing would be a good idea. His trailer hitch hit Rafiki’s front tire and driver looked a bit concerned that he had hit a tourist vehicle. With no damage sustained, we finally made it through the intersection. 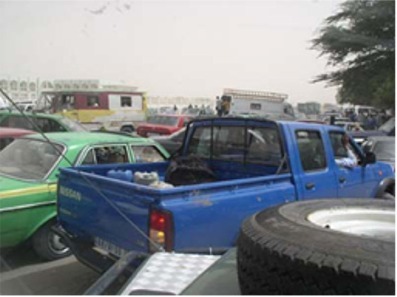 Nouakchott is currently experiencing a fuel shortage (this may be normal; we’re not sure) and most gas stations were empty. The few that did have fuel were apparent by the long lines of cars. We had been told that fuel was available outside of town, so with a little less than half a tank we headed for the next town down the road, Aleg, a distance of about 260km. We tried for fuel at a town in between with no luck. We arrived at Aleg and had to get fuel here in order to make it to the next large town. We pulled into a gas station where people seemed to be getting fuel, but we were told that we had to go see the “Prefecture” to get an “Authorization” to get fuel. When asked where the Prefecture could be found, and were told he was “in the mountains.” (To be fair, since Witt and Graham don’t speak French all that well, this is what we understood. I’m sure that what they were saying was far more helpful). Eventually we learned that he was in the official government building on the hill. We walked up the hill and were told that the Prefecture had gone home for the day, and we received vague directions to his house. Each of these interactions is of course prefaced by lots of “Bonjour, ça va? 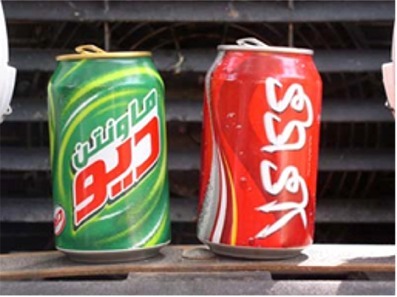 (“Hello, how’s it going?” in French)”, “Salaam Alekum (“hello” in Arabic)”, shaking of hands all around, etc. While all of this was going on, Connie and Jen were stuck guarding the cars, with all the children in the village crowded around asking for “Un stylo (a pen)”, “un cadeau (a gift)”, or whatever they could think of. They’d hang on the door and look around inside and point at stuff asking for it. Eventually the only choice was to roll up the windows and ignore them. We drove in the general direction indicated by the guard at the office, and eventually someone directed us to the prefecture’s house, where he invited us in to his living room. It was air conditioned and very nice. There was a TV in the corner showing “Weakest Link” in French. One of his “people” brought us tea, and he asked us where we were going, where we were from, etc. He wrote out to fuel authorizations for 70 liters each, which judging by how much was being put in other vehicles is a large amount to be given to one person. We received our diesel and after giving 60 Ougs tip to the attendant because he didn’t have any change, were finally on our way. Thinking back on this experience it amazes me that in the entire town there is one guy who can authorize the purchase of gas. I’m trying to imagine having to go see the mayor of Boulder to get an authorization to buy some gas. Oh well, whatever works for them. It only took us about an hour to buy a tank of diesel. We woke up this morning, ground some Kenyan coffee we bought in Paris and used our French press to create a great brew. We’ll enjoy it while it lasts, because when it’s gone we’ll be down to Nescafe. We got on the road at about 830. The passenger side window on Witt and Jen’s car became disconnected from the lifter mechanism, necessitating an early stop for lunch. We disassembled the door panel and used the pull ring off a tin can to try to anchor the window in place. We’ll see how it fares. We arrived in Kiffa at about 2pm. 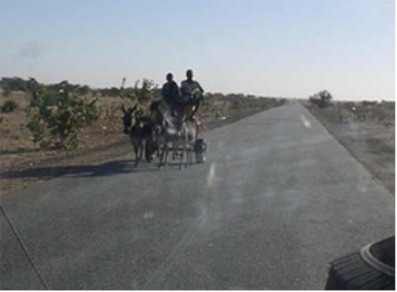 Our intention is to take the dirt road (or piste) 280 km south to Kayes, Mali. Kiffa is the last customs post on this route so we stopped here to get our carnet stamped. We met Lisa and Griff at the customs office who are returning to England from a trip to Ghana. We exchanged information with them while waiting for customs and bought the last of their CFA (Currency used in Mali and many other countries in West Africa). With our paperwork in order, we headed for Kayes, following the waypoints Frederick (from France whom we met at the campground in Marrakech) gave us. The route took us down the runway of the local airport, which was the widest strip of asphalt any of us had seen in some time. 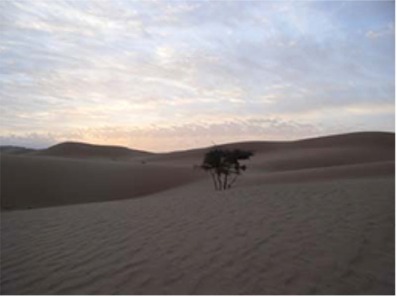 The road is taking us farther into the Sahel and away from the sand dunes of the Sahara Desert. The landscape is rolling hills with dry grasses and some sparse trees and bushes. We camped a little way off the track after a couple of hours and spent the evening repairing tires and writing updates for the website.